Maybe I was craving some vitamin A or maybe I just wanted some healthy comfort food? Either way, I found inspiration in the sweet potato. For a serious dose of vitamin A, in a serious comfort food ingredient, it's got to be all about the sweet potato. When roasted, their sweetness is irresistible. It's like dessert for dinner but healthier. I read that your body's uptake of all that beta-carotene goodness increases if you enjoy them with a little fat. Just one tablespoon of olive oil does the trick. Of course, in this recipe, I couldn't resist using bacon instead! Scrub the sweet potatoes and pierce with a fork all the way around each potato. Place the sweet potatoes on a foil-lined baking sheet. Roast in the oven for one hour or until tender all the way through. While the potatoes roast, heat a medium-sized frying pan over medium heat. Add the diced bacon and cooked until crispy. Scoop out the crisped bacon, leaving the fat in the pan. Add the diced onion and minced garlic to the bacon fat. Saute until the onion becomes translucent. Add the black beans, along with the ancho chili powder and maple syrup. Cook until the beans are fully re-heated. Keep warm over low heat until the potatoes are done roasting. When the potatoes are ready, place each one a plate and cut open down the center. Mash a little of the flesh and spoon on the bean mixture. Sprinkle each stuffed potato with the bacon bits, some cilantro, and a tablespoon of smoked Gouda and serve. This recipe is easily adaptable to whatever ingredients you have available. I already see a ton of variations. 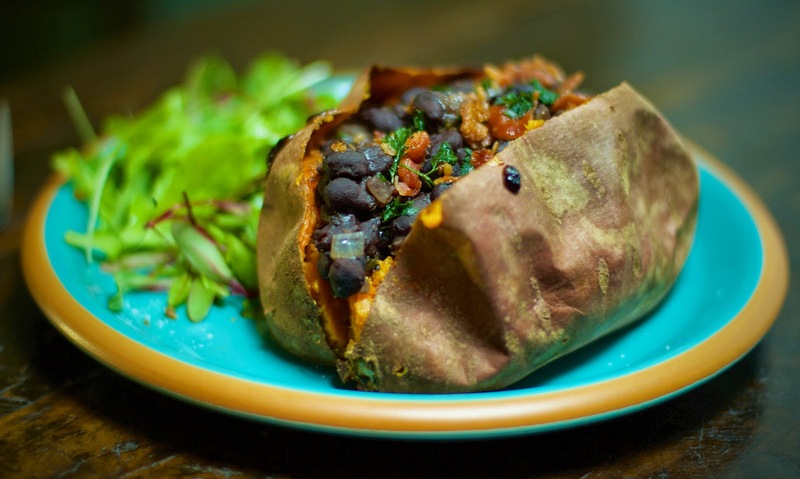 Alicia, this wonderful recipe is easily adaptable for Meatless Monday, too! Hmmmm...decisions, decisions! Glad you like it Valerie. And yes, definitely adaptable for Meatless Monday.